We got the UV-reactive ABS and PLA filament wraps to play with out of pure curiosity from 3DFilaPrint. They are made by RepRapper Tech and the version of the filaments we got is the one that is supposed to change its color from solid white to blue when exposed to UV light. Other than the seemingly interesting property to change the color these two filaments are pretty much standard ABS and PLA and should be printed with the normal settings that you use for the respective filament. We watched an interesting promo video on the supplier’s website for the UV-reactive filaments that quickly change their color when brought outside on a bright sunny day and it all seemed nice. Since the bring sunny days are over for a while at this time of the year we were prepared to test the interesting properties of these filaments with an strong UV flashlight that can produce similar results as you should experience on a bright sunny day outside in terms of a level of UV light, but to a focused point. 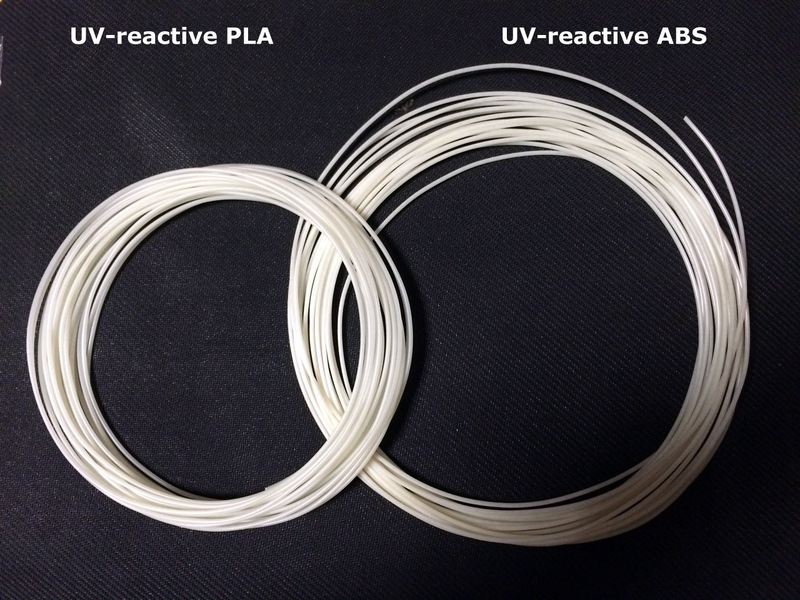 Before resorting to the flashlight we saw that both the ABS and the PLA filaments were pretty similar in color, though there was a bit of a difference in the level of the white between the two. When the filament is indoors where there is no UV light at all or the levels from the indoors lights are very little the filaments remain pretty much light. We expected that when we bring the UV-reactive filaments outside, even when if it was a cloudy day that they will start turning blue in color as even though there is no direct sunlight there is still UV light. To our surprise the result was very hardly seen bluish tint starting to appear over the white, so apparently the filaments need a lot of UV light to change their color from white to blue. When we turned on the UV flashlight the effect was immediately seen – white filaments turning to nice blue color at the stop we shine with the flashlight. When we turn off the flashlight or bring the filaments indoors again after they were exposed to UV light outdoors the blue color disappears very quickly and the filament is white again. So what is our conclusion about these color changing filaments that react to UV light? Well, although the idea seems quite nice at first and you might think of some interesting and creative projects where to use this effect, we are actually disappointed after playing with the filament for a bit. 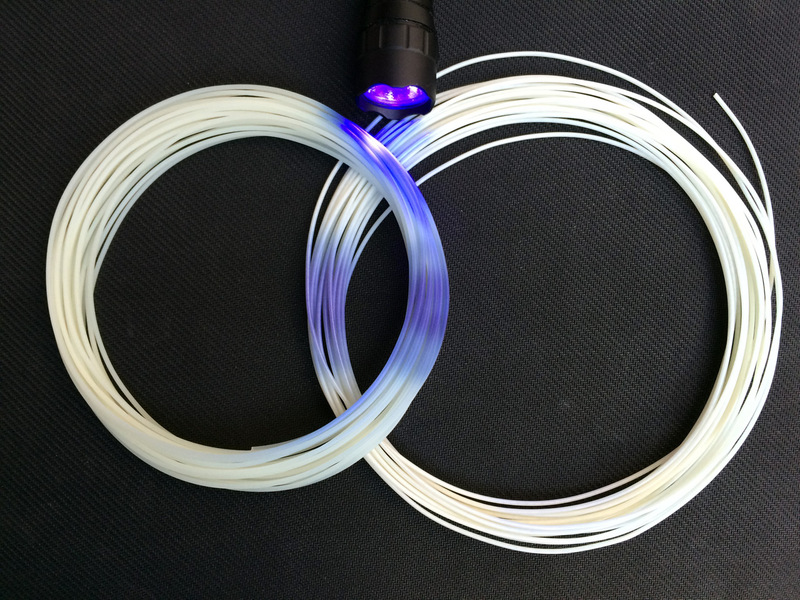 To get a nice blue (or pink or another color) from the white filament you need to expose it to a lot of UV light and you normally can get this much on a bright sunny day only or if you use a special UV light like we did with out flashlight. Even if you manage to get the effect of the filament changing color to a nice and intense blue (you need a lot of UV light for that) when the light is gone in no time the color is back to white again, so if you want to keep the blue color you need the filament constantly exposed to strong UV light. So while it was nice checking it out we don’t think that we’ll be needing a whole spool of this UV-reactive filament, either ABS or PLA, for the moment as we are not too happy with the results we saw. Though the UV-reactivity of the filament changing its color might be a nice effect it is not working that well, or at least it is not working that well with the filament type we have tested with.